Most people have childhood memories that, I hope, are fond to look back on. As weird as it may sound, my own fondest memories are going to work with my dad. Not only did I get out of school for an entire day, I was able to play all the free games I wanted at the Atari offices. In 1988, my dad, Glenn McNamara, was hired as an Electronic Engineering Technician at Atari Coin Op, the headquarters of Atari arcade games. Some of the games he worked on during the ten years he was there include Pit Fighter, Badlands, Stun Runner, Road Hog, Relief Pitcher, Hydra, Hard Drivin, Tetris, and his favorite, Steel Talons. As a member of the new iGeneration, I find it fascinating to talk to my dad about when he was involved with “cutting edge technology” of the 1980’s. Before the Internet was readily available to the public, my dad was the “go to guy” for co-workers who needed to get information from early forms of websites, usenet, and FTP sites. During our conversation, he recalls a version of the internet when just having a mere online presence—even though it may have been one page—was a major accomplishment as well as “cutting edge.” In the 1980s, there were few “websites” as we know them today because the Internet was so new, strange, and uncharted that few people took it seriously. It was for geeks, not popular culture. Society back then could not imagine what the future had in store for digital technology, mass communications, and Internet culture. It hasn’t stopped at games either; now people use their avatars to buy and sell real estate, clothing, and even their own personal art pieces for real money in Second Life, which is, EXACTLY like… well… a second life! French sociologist Jean Baudrillard referred to this as “our electronic doubles,” a.k.a. a form of simulacra. We have one life outside the digital realm, and another life inside microchips, software, and fiber optic cables. In the 1980’s, Atari employees and gaming enthusiasts all over the world were quite creative but their imaginations were confined due to hardware limitation. They were constantly trying new ways to improve hardware and accommodate quirky and innovative ideas. Not many of their concepts were supported by the hardware of the day. There was an extremely innovative idea, however, that was supported: Ray Tracing. Ray Tracing simulates many types of optical light actions such as scattering, refraction, and reflection; it is capable of producing a very high quality photorealism. This effect is not only used in games, now it is used in movies such as Cars and Toy Story. One of the trade mark characteristics of Atari 80’s games is the square-like look that results from Polygonal Modeling. Polygonal Modeling uses polygons to create shapes and textures, giving the graphics a square look with sharp lines and pointed edges. When creating textures, many small polygons consisting of different tones would be used together to give the illusion of texture. Another hot hardware item for the 80’s and early 90’s was Growth Motion. This was responsible for the scaling of objects and used in games such as Pit Fighter to create the illusion of depth. Pit Fighter was also the first fighting game ever to feature digitized characters based from real living actors. The actors of the characters were actually banned from going to the arcades because the players would go wild when they saw the characters in their real human form. My dad worked on the hardware for many Atari games including Stun Runner. Stun Runner is a futuristic speed bike that you race through tunnels and around tracks going around 900 miles per hour. My dad actually designed the track for level 15, which is named after him and titled “McNamara’s Revenge.” Instead of a control panel, the arcade game has a STUN bike that the player would sit on while they race. The hardware was based on another game by Atari that my dad is credited under: Hard Drivin. Hard Drivin was released in 1989 and was the first driving simulator to use 3-D polygonal graphics. The players sat down in the cabinet and had a first-person point-of-view of the track; players had pedals for gas, break and clutch. The handling of the car was so realistic that teenagers practiced their driving skills on this game without the fear that comes from going behind the “real” wheel in the “meat world” (1990s net term for life). I remember driving that game when I was four years old, barely able to see over the wheel and yet feeling so grown up. Never mind the fact that I did not actually finish a race—it was always a special treat to visit Atari when I was so young, especially when I was able to get out of school for a day! Another plus: my dad was able to take the games home and we turned our garage into a mini-arcade with STUN Runner, Steel Talons, and Tetris. My dad left Atari in 1998 when the company started going through difficult times; it had been bought and sold by many different companies by then. Ataricade which is dedicated to the Coin Op division where my dad worked. Although Atari has been shut down for some time, it will never be forgotten. 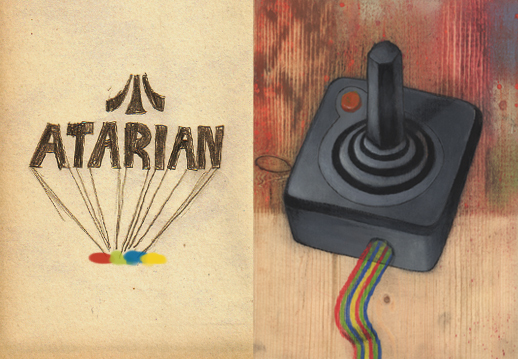 Do you have any fond memories of playing Atari games? Previous PostSeptember Cause: Read A Book, Kid! That’s so cool. I used to play joust until my eyes bled. while hard drivin’ and its brethren came out at the end of my arcading years, I was nonetheless staggered by the quality of HD and spent considerable time/cash playing it. those were the last glory years for atari imho, just before all the great names — williams, midway, taito, stern, and atari — went inexorably downhill. the atari 800 was the best personal computer i had too, until the mac.